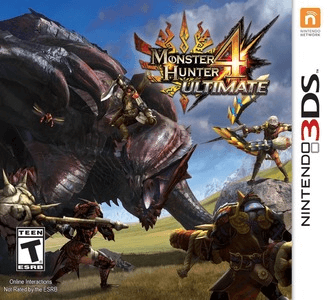 Monster Hunter 4 Ultimate is an action role-playing video game developed and published by Capcom. It is an improved version of Monster Hunter 4 and is the first fourth-generation Monster Hunter game to be released outside of Japan. Monster Hunter 4 Ultimate doesn’t seem to have major graphical or audio issues on Citra in most areas, and you can finish the game. However, some cutscenes are completely blurry due to gas rendering issue. And because the game renders in stereoscopic 3D, you will experience another kind of blurriness in all 3D scenes, which is like ghosting. The game run at unacceptably low speed in many areas and game movies, even on powerful hardware, and speed is especially low in towns. This is partly because the game forces 3DS to render in stereoscopic 3D. It should run with greater performance. HR9 Village Quests HR9 quests available in village, HR5 in guild. Should be able to see a lot of the monsters and areas.